In this pAsuram, maNavALa mAmunigaL raises an imaginary question. He believes that Sri rAmAnuja might have had this as a question on his mind and subsequently maNavALa mAmunigaL tries to answer him in this pAsuram. The question / assumption is as follows. SrI rAmAnuja asked maNavALa mAmunigaL, “hey maNavALa mAmunigaL!!! You have not taken account of the sins that you have accrued. Yet you yearned for [the opportunity to serve]. What should I do now in this regard? Please tell me”. maNavALa mAmunigaL replies, “hey! 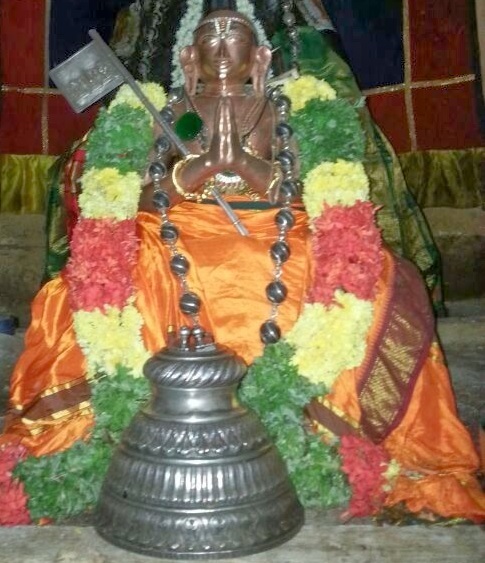 SrI rAmAnuja! The time between the day when you took me to your fold and today, you have patiently watched my sins. You have also ensured me of paramapadham, for which I did not have any eligibility. Now, you should not delay it further and should grant me mOksham immediately”. ethirAsA – Oh! ethirAsA! my master! The leader of yathis!!! seydhAy – You did this. Did’nt you? vagai – (for me to have this regard for you) this way. unnai vandhu irappadhAm – and I come to you and plead you for support. iravupagal – day and night. cheidhu aruLavENdum – bless me with that. In this pAsuram, maNavALa mAmunigaL asks SrI rAmAnuja to quickly grant him the ticket to paramapadham. He says that right from the day when SrI rAmAnuja took him to his lotus feet with the thought that “maNavALa mAmunigaLis mine” till today, he is incessantly committing innumerable sins. Just moments after committing those sins, maNavALa mAmunigaL says that he would repent very much for doing it but that would never stop him from doing it again. This has been the case for a long time and all these days, Sri rAmAnuja did not look at the sinful side of maNavALa mAmunigaL, nor did he hate him for doing that. maNavALa mAmunigaL says that instead he made sure that he got uninterrupted service at his lotus feet day in and day out. Today, SrI rAmAnuja was even contemplating on blessing maNavALa mAmunigaL with the paramapdham. maNavALa mAmunigaL asks SrI rAmAnuja, if that is the case, what is the reason for the delay and requests him to bless immediately. maNavALa mAmunigaL says, “Oh! The leader of yathIs (sanyAsis)!!! You have blessed this soul with your thought that “this soul is mine”. You have done so without any reason for it. I knew about it and thanks to your blessings, I became an entity reserved exclusively for you and for no one else. From that very day till today when I seek your lotus feet, I have continued to incessantly commit nothing but sins. I repent immediately and plead to you for support. You did not dismiss me or hate me for doing sins. On the contrary, you have gifted me with uninterrupted service to you , at your lotus feet, day in and day out. Not stopping with that, today you were even thinking of granting me paramapdham, the place reserved for highly deserving people. You were thinking to offer me a ticket to paramapdham, a place to which I am completely ineligible to go to. Having had this very thought, SrI rAmAnuja, what is the reason for your delay? I request you to bless me immediately”. This entry was posted in Arththi prabandham, Other and tagged arththi prabandham, mamunigal, ramanuja on September 23, 2016 by santhanam rajagopalan.